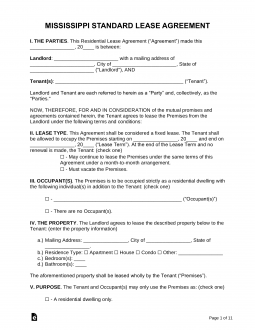 Download Mississippi lease agreements for an arrangement between a landlord and tenant for the usage of space, either for living or a business, in exchange for the payment of rent. Before a contract is signed the tenant will usually view and approve of the space. A monthly amount is negotiated upon between the lessor and lessee and an application will be completed. After careful review the tenant will either be approved or rejected. If approved, the parties should draft an agreement and authorize. Rental Application – Tool used by the landlord to inspect the background and references of the potential tenant. Commercial Lease Agreement – Contract for the leasing of space to be utilized by a business. Lease with Option to Purchase (Lease to Own) Agreement – Standard residential version with option to buy. Month to Month Lease Agreement – Known as a tenancy at will and should be written in accordance with § 89-8-19 and can be terminated at any time, by the landlord or tenant, within thirty (30) days. Room Rental (Roommate) Agreement – For shared housing arrangement to have a common agreement amongst the roommates. Standard Residential Lease Agreement – Fixed term usually for a period of one (1) year. Sublease Agreement – For a tenant looking to find another individual, ‘subtenant’, to be able to occupy the same space and continue payment. Termination Lease Letter (§ 89-8-19) – Thirty (30) day notice given from either the lessor or lessee when terminating a month to month rental contract. The State of Mississippi does not require that the landlord provide any additional disclosures. Lead-Based Paint – Federal law that requires any residential unit built prior to 1978 to have this form attached to any agreement to inform the lessees of the possibility of this hazard in the walls. The State of Mississippi does not require the landlord to give the tenant notice before going into their property for maintenance or other reasons. Maximum – There is no limit on how much the landlord may request. Returning (§ 89-8-21) – Landlord must give the funds back to the tenant within forty-five (45) days after the date marking the end of tenancy.